Great for many so many occasions! 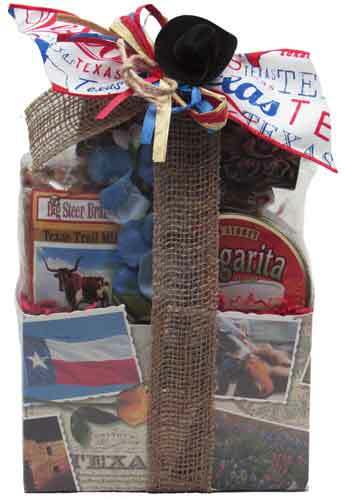 This container has photo scenes of Texas on all sides. 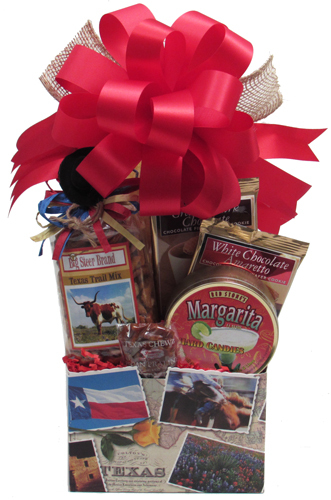 Filled with Tortilla Chips, Texas Snack Mix (topped off with a cute felt cowboy hat & lariat), Creamy Dark Chocolate filled Butter Wafer Cookie, White Chocolate Amaretto filled Butter Wafer Cookie, tin of Margarita Hard Candy Drops (no alcohol), and a Chewy Praline. Wrapped in crisp clear cellophane and topped off with a Handmade Bow with a bit of Burlap. Includes a Handwritten Greeting Card. This is great for out of town guests, because the container flattens for easy travel. Finished wrapped design for local hand delivery, approx. 14"H x 7"L x 4 1/2"W. For shipping: shrink-wrapped with a different style enhancement.